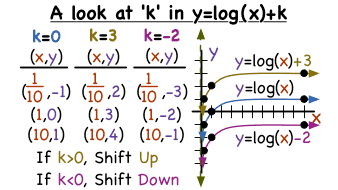 What Does the Constant 'k' Do to the Graph of f(x)=log(x)+k? Translating a logarithmic function vertically can be fun, especially when you know how it's done! This tutorial shows what it takes to shift a logarithmic function up and down!